Losing power at home is inconvenient. When it happens, the worst part is not knowing if the outage will last for a couple hours, or if it will stretch on for days. But if you take a little time to get organized and round up a few items today, you will be ready to keep your family comfortable when the lights go out. Experts like Del Grande recommend grabbing an oversized plastic bin and loading it with the essentials so you’re ready when the lights go out. Pull together some non-perishable, ready-to-eat foods. A couple jars of peanut butter and some boxes of crackers can go a long way in keeping your family happy and fed. Also, include some canned goods, like meat, fruits and veggies, along with instant hot cocoa and coffee. Include energy-dense foods like protein bars, dried fruit, peanuts and nuts. Finally, don’t forget the goodies, like fun-size candy bars and chips and salsa. Keep your camp stove or grill in a place where you can easily pull it out, but remember, do your cooking outdoors. Make sure you have the right supplies to get you through those long nights and brief days of winter, safely. Round up all the flashlights in your home, pull out that battery-operated camping lantern from the garage and get them into one convenient place. Then, the next time you’re at the store, pick up extra batteries so you can keep those lights going throughout the duration of a power outage. Keep a stack of quilts, old comforters, woolen blankets and even sleeping bags handy so you can all snuggle in. Along with these, gloves, scarves, sweaters, fleece and stocking caps can also ward off the chill that will creep in. It’s the immutable law of the power outage: It always hits when your device has less than 20 percent battery power. Pick up a couple of rechargeable power banks to keep smartphones and other electronic devices powered up. And don’t get rid of older devices such as MP3 players and personal compact disc players. Use them to play music or an audio book when the lights — and the Wi-Fi — are knocked out. Finally, have some low-tech entertainment at the ready. Books, board games and even a deck of playing cards can help pass the time and maybe even help with family bonding. A great way to ensure you have safe, reliable backup power in the event of an outage is to invest in an automatic standby generator like those from Kohler. These generators are installed right outside your home, much like a central air conditioner. Once the power cuts out from your utility provider, a standby generator kicks in within seconds, even if you’re not home. 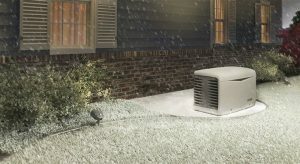 That’s because standby generators connect to your existing fuel lines, whether it’s natural gas or propane. So the next time the outage hits, your family won’t be without the furnace, water heater, refrigerator, stove, or anything that runs on electricity, including smartphones and computers.